The St. George's Club is comprised of cozy cottages nestled amongst 18 acres of flourishing tropical landscape. 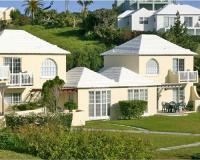 St. George's Club Resort is Bermuda's premier cottage style resort, high on Rose Hill overlooking the picturesque UNESCO World Heritage site of the town of St. George and its historic harbor. St. George's Club offers a private beach, two restaurants, three pools (one heated) three tennis courts, a fitness center, a Scooter rental available on property. A complimentary Shuttle bus service is available from the resort to the town or beach between April and October..